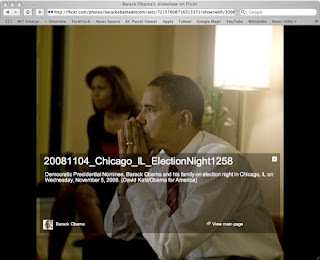 David Katz, a photographer and staffer on the Obama campaign, provides an insider's view of the reactions and emotions on display within Obama's inner circle as the returns came in on election night. These images are in and of themselves remarkable and historically very important. Other than merchandise being offered through Katz's website, I trust the images are being preserved by the copyright holder or the campaign and made available for licensing/publishing. A quick search for photographer "David Katz" in the editorial collections at gettyimages.com and corbis.com yielded zero results. The images are available today on Flickr.